Wooden furniture might not strike you as particularly unsustainable for the environment. But consider all the energy wasted by growing a tree for 60 years, chopping it down, and shipping it to a factory, where it will get further pulverized only to be re-shaped into a usable piece of furniture. Gavin Munro, a furniture designer based in Derbyshire, England, has found a way to cut out all the steps after the growing. 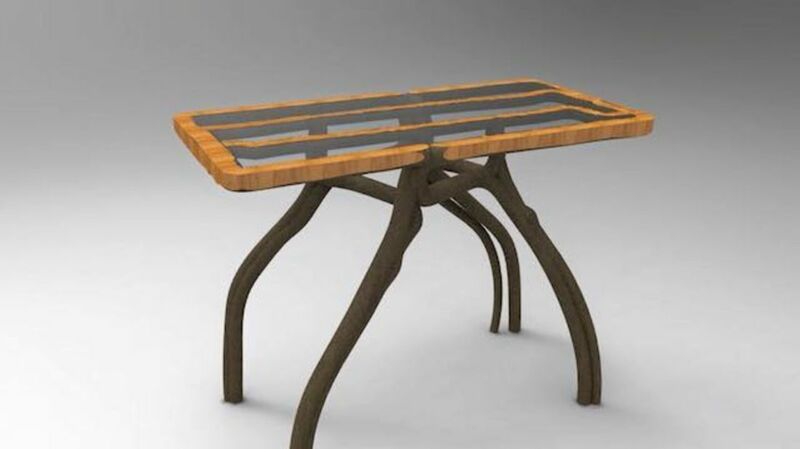 His company, Full Grown, uses specially designed plastic frames and strategic grafting to mold young willow, oak, ash, and sycamore trees into a chair, table, mirror, or lamp. The end result is a sturdy piece of furniture made of a single, continuous piece of wood without joints or the need for any assembly. After his initial attempts at this so-called "botanical manufacturing" were destroyed by meandering cows, Munro successfully grew a chair out of four separate trees grafted together. Now, on a 2.5 acre farm in Wirksworth Munro, 39, tends and sculpts a furniture forest of 400 trees, divided by wood type and intended object. "In essence, it’s an incredibly simple art," he told Fast Company. "You start by training and pruning young tree branches as they grow over specially made formers. At certain points we then graft them together so that the object grows in to one solid piece." After the wood matures to be strong and stable, the piece will be harvested. And although the process is uniform, the result is distinct. "You can make thousands of these in the same way as you can make 10, but each one is unique," Munro told the Guardian. The first chairs, which each take about four years, should be ready for exhibition this October. You can preorder one now to be delivered mid-2017, but Munro can only make about 50 pieces a year and each one will cost you $3700—a price that reflects what is still essentially functional art. But Munro hopes Full Grown will itself grow, and perhaps inspire similar eco-friendly furniture production companies if the revolutionary method proves viable and popular. "We hope and trust that this will eventually become an improvement on current methods," he says. All photos courtesy of Full Grown Facebook page.